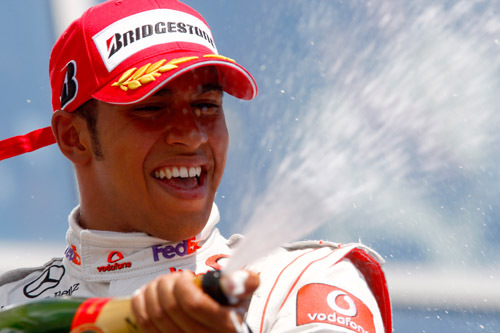 Lewis Hamilton has driven a compelling race to win his first Grand Prix of the season this afternoon (Sunday 26 July 2009) in Hungary. The BRDC Full Member who has had a torrid season so far as defending champion started fourth on the grid and managed to get into third place from the start of the race. And with only three laps gone Lewis made an impressive passing move on Mark to take second place. Lewis was on the pace and in the early stages was continually the fastest man on track and from then on his strategy worked perfectly to en able him to secure the result he’d been looking for all season. There was double BRDC celebration as Full Member Mark Webber held on to secure the final podium spot. Jenson Button finished the race in seventh while Brawn his team-mate and Honorary Member Rubens Barrichello just managed to finish inside the top ten. Honorary Member Fernando Alonso was forced to retire from the race on lay 16 with a problem with the front right of his car. This came after a scare on lap 13 which saw his right front tyre fly off. He was able to get back to the pits, which moved Lewis into the lead, but three laps later though Fernando came back into the pits and retired from the race.